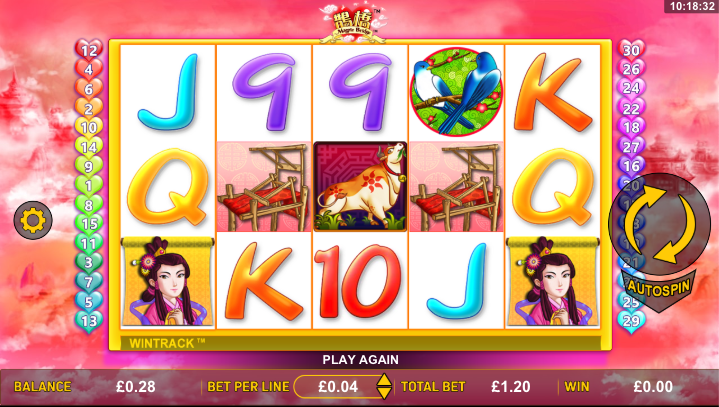 A tale in Chinese folklore tells of a flock of magpies who create a bridge with their wings to help Zhu Ni reach her husband on the other side of the universe; this is the Magpie Bridge and it’s the theme of this online slot from Aspect Gaming. Magpie Bridge is a five reel slot with three rows and thirty fixed paylines; behind those yellow-rimmed reels there’s a pinkish view of temples and other Chinese buildings emerging from the cloudy haze. The higher value symbols include the two protagonists in this story – Zhu Ni and her husband – along with a cow and loom. 9, 10, J, Q, K and A represent the lower values. The wild symbol is a charming animated silhouette of the husband and wife, it appears on reels two, three and four and it will replace all others to help form winning combos except for the magpie and heart bonus icons. The wild will multiply any wins in the base game by 3x. This is triggered by landing at least three of the magpie bonus symbols anywhere in view for you’ll receive an initial ten free spins. There’s not much else to add here except that a winning combos including a wild symbol will be subject to a multiplier of 7x. 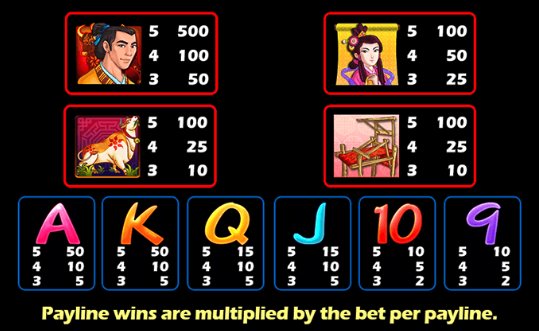 Trigger this by landing two of the heart bonus symbols on reels one and five in the same spin; you’ll now be asked to select one of the hearts on show to reveal a 500x, 10x or 5x multiplier of your total stake. We have a soft spot for slots themed on ancient legends and folklore and Magpie Bridge is certainly one of the more unusual tales; it’s quite a basic slot but enjoyable in its way and the bonuses seem to hit regularly. It comes with an RTP of 94.03%.